LONG BEACH — Roy Pat Disney’s Andrews 68 Pyewacket finished in first place on corrected handicap time in the West Coast 70 class at the 2013 Campbell Cup Regatta, Oct. 12-13. Meanwhile, Jeff Janov’s Farr 40 Dark Star took first-place honors in its class — making this Janov’s third consecutive year winning the two-day regatta, hosted by Long Beach Yacht Club and sponsored by North Sails. On a picture-perfect weekend of sunny skies and moderate breezes of 8 to 13 knots, five West Coast 70 Class racing sleds and nine boats from the West Coast’s Farr 40 fleet used tactics and skill on the same windward/leeward ocean course used during Long Beach Race Week. 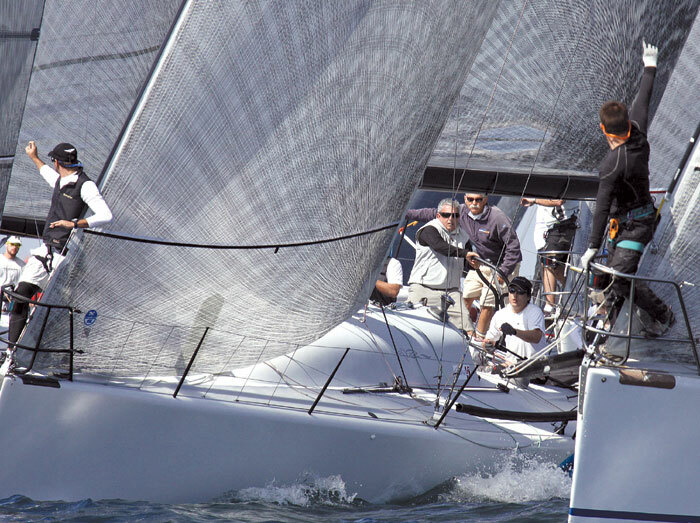 The course will also be used in the next Rolex Farr 40 North American Championship Race, May 14-17, 2014. The boat evidently continues to possess that lucky charm, finishing in first place in four of the five races this weekend. And Pyewacket’s crew dominated the West Coast 70 Class. “There are always the same challenges in any regatta,” Little said. “We worked hard on improving our communication — and that, I think, was the difference. Janov had a little more of a challenge in the Farr 40 class, but stumbled only once and held on to claim first place in the regatta. “On our first race today, the start was devastating,” Janov said. “We ended up match racing with (Jeff Shew’s and Bill Durant’s) Viva La Vida and didn’t get a good start. From there, we had to claw our way back to get a third. “The last race of the day we really got a good start,” Janov said. “Dave Ullman (tactician) was really in-phase during the regatta, keeping us in good position. Janov gave full credit to his crew of Dave Ullman, Randy Smith, Yumil Dornberg, Eric Champagne, Michael Bradley, Kelly Buchan, Kaytlin Hall, Travis Wilson and Tyler Wolk. Second place in the Farr 40s went to Dirk Freeland’s boat, Skian Dhu. Freeland also stumbled during the regatta, but his team fought hard — and they finished within three points of first place. “We had a tough first race yesterday, getting a sixth,” Freeland said. “But we came back with a first-place finish in the very next race. “In the last race today, we were just trying to cover Viva La Vida, and did a really decent job,” he said. Victoria Campbell, wife of regatta namesake Mike Campbell, was on hand at Long Beach YC Oct. 13 to present trophies to the top three finishers in each class. Long Beach YC thanked Victoria Campbell for her continued support of the regatta that her husband inspired. Legendary sailor and big-boat supporter/owner Mike Campbell originally organized the event in 2006, and it was then called the “70s Invitational Race.” Campbell had wanted to sponsor a regatta with the purpose of bringing together big boats for a fall event. After Mike Campbell died in October 2008, it was decided that the Farr 40 class would be invited in 2009, and the regatta would be renamed in his honor — as an appropriate tribute. 1st: Pyewacket, Andrews 68, Roy P. Disney, Waikiki YC; 1, 1, 2 (1 penalty point taken), 1, 2 — 7 points. 2nd: Holua, Santa Cruz 70, Brack Duker, California YC; 2, 3, 3, 2, 1 — 1. 3rd: OEX, Santa Cruz 70, Peter Tong, Long Beach YC: 4, 4, 2, 2(penalty pt. taken), 3 — 15. 4th: Grand Illusion, Santa Cruz 70, Edward McDowell, King Harbor YC; 3, 2, 6 DSQ, 3, 5 — 19. 5th: Mirage, Santa Cruz 70, John DeLaura, Shoreline YC: 5, 5, 4, 5, 4 — 23. 1st: Dark Star, Jeff Janov, California YC, 1, 5, 1, 3, 1 — 11 points. 2nd: Skian Dhu, Dirk Freeland, Santa Barbara YC, 6, 1, 3, 2, 2, — 14. 3rd: Viva La Vida, Jeff Shew/Bill Durant, Long Beach YC, 2, 3, 2, 6, 4 — 17. 4th: JoAnn, Steve Murphy, Seal Beach YC, 3, 2, 7, 8, 3 — 23. 5th: Temptress, Ray Godwin, Long Beach YC, 5, 7, 6, 4, 6 — 28. 6th: Foil, Gordon Leon, Cabrillo Beach YC, 7, 4, 4, 5, 9 — 29. 7th: White Night, Jim Murrell, King Harbor YC, 4, 6, 5, 7, 8 — 30. 8th: White Knight, Zoltan Katinszky, Cabrillo Beach YC, 8, 8, 8, 1, 7 — 32. 9th: Flyer, Stanford Shaw, Santa Barbara YC, 9, 9, 9, 9, 5 — 41.